-Why did you start blogging? I started blogging to create a diary of our lives. I have a terrible memory and want to remember as much as I can when I'm older and I thought this was a great way to do just that. I hope my kids will look at this one day and know just how much I love them and how much fun we had! -What are your goals for your blog? -If you could have one wish what would it be? -If you won the lottery what would you do with the money? -What is your biggest insecurity? My body. It's not even that bad, but it's hard for me to grasp this whole "Mom bod" I'm rocking. -What is your favorite travel destination? I have 2 - Aruba & Disney World. We went to Aruba for our honeymoon and my goodness was it GORGEOUS! Beautiful white sand, amazing food and drink and great atmosphere. I can't wait to go back one day. We went to Disney World last year with the kids and we all had the best time ever! We are counting down until we go back! -Have you ever met anyone famous? If so, who? Ha ha, Joey Gladstone (aka Dave Coulier)! It was at the airport and only for a second when I was so little. I also knew most of the members of Fall Out Boy before they were huge and famous. I dated a guy in who was in a band and he was friends with them. I hung out with them quite a few times, then me and the boy broke up and the band got huge. I also came sooooooooooo close to meeting Guilianna & Bill. The hubs and I went to dinner at RPM Italian in the city (Chicago) and I kept saying, I know we are going to see Gulianna & Bill! He of course thought I was crazy. Well, we had our dinner and the waiter asked if we wanted dessert and I said no. We got up and started walking out when we saw them walking in. Lo and behold they sat down at the table right next to us...ahhh if only I would have had that damn dessert. -What is your favorite thing to do in your free time? -What is your favorite meal? -What is your favorite holiday and why? I have a couple but Christmas hands down wins. I just love the whole spirit of the holiday. It's the one time of year I always look back on and get all warm and fuzzy thinking about all the fun we have. I love watching Christmas movies, making Christmas cookies, going to see the lights, chopping down our tree, visiting the mall during the craziness, seeing the Big Guy. It's all so great and it's become 1000 times better with kids. -What are three items that you couldn’t live without? Now, I nominate the following blogs to partake in this fun award! Here are your 11 questions ladies! What's the story behind the name of your blog? How long have you been blogging and what makes you keep it up? Are you married? If so, how and when did you meet your spouse? If you could wake up tomorrow in someone elses body, whose would it be and what would you do? Are you superstitious? If so, what are you most superstitious about? Thank the blogger that nominated you in your post and link back to their site. 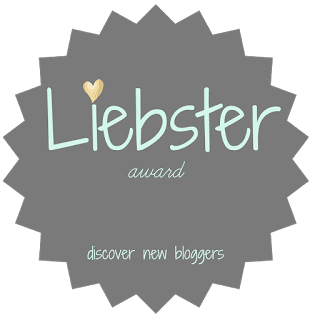 Display the Liebster Award logo on your blog. Answer the 11 questions from the blogger that nominated you. Tell your readers 11 random facts about you. Nominate 5-11 blggers with less than 1000 followers for the Liebster Awards. Ask your nominees to answer 11 questions.